I only work with a small number of clients at any one time. I have offices in Somerville, Massachusetts, and York, Maine, where you can come and meet with me. Due to the availability of telephones, fax machines, and emails, I am also able to represent you if you are not able to come to either office or if you live in another state. You’ll be working with me and only me. You will never meet with or talk to any paralegals, assistants, and certainly no sales people. 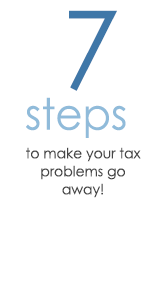 The Process- 7 Steps to making your tax problems disappear. 1. The Get Acquainted Meeting. We’ll meet in person or by phone to thoroughly discuss your tax situation. After fully understanding the history of your tax problem and your current situation we’ll begin to choose the best strategies to solve your tax problem. 2. Sign a Power of Attorney. You’ll sign a Power of Attorney that will put the IRS on notice that I will be representing you. You will no longer have to worry about communicating with the IRS as all future telephone calls and communications from the IRS will come to me. 3. Learn What the IRS Knows About You. I’ll obtain and review IRS transcripts so that we can be sure we know exactly what the IRS knows about you and so that we can avoid any unnecessary surprises as we work toward resolving your case. 4. Develop the Best Strategy to Solve your Problem. I’ll fully analyze your case to develop a strategy that will reduce the amount of taxes that you pay to the least amount legally possible. The tools available will include making offers in compromise, entering into installment agreements, utilizing the statute of limitations, qualifying you for Currently Not Collectable or Innocent Spouse status, abating penalties, and sometimes combinations of a number of a number of these tools. 5. Gather Your Information and Records to Present the Best Possible Case. I’ll provide you with easy to follow checklists of additional information that we’ll need to provide to the IRS. I’ll fill out the IRS forms to present your case in the best possible light. It will be your job to get me the information I need to do my job. I’ll make that process as painless as possible by sending you checklists for you to follow. 6. Prepare the Forms Required by the IRS to Resolve your Tax Problem. I’ll prepare all the forms that the IRS will require. You will only need to review and sign them. 7. Negotiate with the IRS to obtain the Best Possible Settlement. I’ll work with the Revenue Officer, Collections Specialist, or Appeals Officer to get you the best deal possible. I’ll thoroughly review all aspects of your settlement with you and answer any questions that you may have to be sure that you are completely satisfied.